As technology continues to grow and our phones\other smart devices become a staple-point of our lives, you never know when you’re going to need to talk to somebody. It can happen anywhere — on the go in the train, bus, while driving, or merely leisurely listening at home. “Convenience” is a big word for our culture, especially as devices become more and more advanced. We wanted to find an array of headphones with mics to give you some options, whether it’s the type of pair, price-range or extra features you’re in need of. Let’s get down to it. 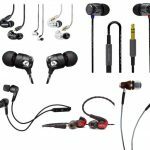 Your budget – It’s a large range out there when it comes to headphones, but we’re assuming you at least have a price-point you’re keeping in mind upon reading our list below. For some encouragement, they’re not quite as expensive as some studio headphones out there, but depending on where you look or what you want the price may start to get up there. The next factor in our checklist may also influence how much money you’ll need to spend (or want to save up and wait for). What type? Our best Bluetooth headsets highlighted a bit of a different spin when it comes to talking to others hands free (it may be what you were looking for, so double-check), but in our case right now, the “best headphones” gets a bit more complex when choosing the model for you. In our search, we found all types to give you options. 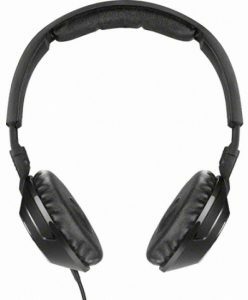 Below are the different types of headphones to help spell it out. 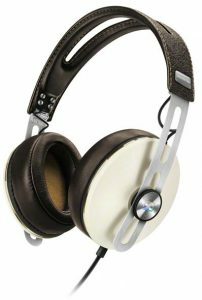 Over-Ear: Although most “headphone types” can be self-explainable, these are the traditional headphone look with a headband that are also called “on-ear” as well. In-Ear (earbuds): The smaller headphones that fit inside of your ear — most call them earbuds, while others in-ear. These are preferred for those who are in need of a little more versatility when moving around, especially if you’re exercising, traveling, and more. Wireless vs. wired: Our wireless headphones and wireless earbuds guides constrained this factor, so be sure to check those out if you’re interested. Otherwise, we made sure as to include both connectivity types below to give you some choices. 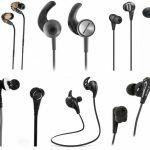 Extra headphone features – Do you want some noise-cancelling headphones? Extra emphasis in bass? Memory-foam builds? Waterproof headphones? Our summaries will highlight each pair’s strengths. Up first we have the stylish, over-ear Bose SoundTrue which design and sound quality makes them one of the best headphones with a microphone. The SoundTrue’s are engineered for your Apple devices, with propriety Bose technology sound that delivers clarity and depth which other headphones in this guide may not provide. They feature a soft-padded headband and memory-foam ear-cushions to ensure long-term comfort. The fold-flat earcups and matching carrying case make this model easiest for your long travelling trips. It also comes equipped with an inline microphone and remote to control your music and/or switching between calls and music with select Apple iPhone models. The inline mic lets you take (or sometimes ignore) an incoming call with the click of one button – so you don’t have to pull out your phone in the airport or airplane, simple right? Now if you have more leeway in your budget and you want a proven brand, then hop on the Bose SoundTrue model — they’re pretty affordable, too. 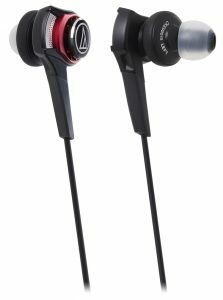 If you want some in-ear headphones with solid bass and an in-line mic, then the Audio-Technica ATH-CKS990iS might serve you well. They have quite a few different models in their series of earbuds, however this one was best in our opinion due to the overall affordability and quality it brings us. The newly designed 13mm ‘Dual Magnetic-Field’ drivers feature an extra magnet in front of the driver to create a powerful, non-distorted bass to your in-ear headphones. The ‘Dual Bass Venting System’ also optimizes air damping for quality bass reproduction – making the bass not only loud, but pretty refined as well. The 1.2m cable is made up of two separate star-quad cables, one for the left and one for the right, improving isolation from external noise and cross-channel talk. It also features the in-line mic/control to answer/end calls or change-up your music without having to pull out your smart devices and do it manually – convenient! The Audio-Technica’s come with a 4-sized silicone eartip kit (XS/S/M/L) and a two-position post to maximize sound isolation while providing a custom fit. If you love crisp, clean bass for your electronic music, then invest in this pair that provides quality sound whilst also having a mic for your own convenience. Up next we have one of the best headphones in the market, let alone with a mic, the Sennheiser Momentum 2. Although you’re getting an amazing pair here, they do sit in the higher price-point of this guide. First of all and like all in this list, these over-ear stereo headphones feature an integrated in-line remote that lets you control the phone calls, music, and volume. This new generation of Momentum headphones offers optimum noise isolation and eliminates all aural nuance, thanks to their proprietary 18 ohms (impedance) Neodymium transducers. This model also features a trademarked Momentum sound which provide a robust frequency response of up to 16 Hz. The awesome design of the Sennhesier Momentum feature sliders made of stainless steel, and leather covering the new, softly designed ear cushions making for a comfortable closed circumaural experience – making these almost a necessity on a long car or plane ride. They also come with the standard low profile 3.5mm stereo jack which makes it compatible with almost any device. 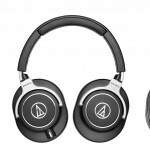 If you are looking for something created for comfort with very solid sound and have some money to spend, grab the Momentum 2.0. 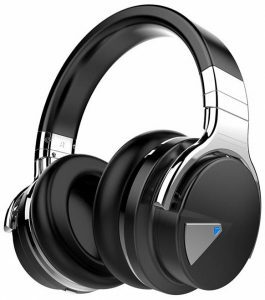 Here we introduce the budget-friendly Cowin E-7, a wireless, noise-cancelling model that sit in the lower price-point of this guide. These over-ear stereo headphones also feature a built-in microphone and volume control that make these work best for traveling, work, or anywhere between. The Active Noise Cancelling technology allows you turn on/off the noise cancelling mode by just the flip of a switch when needed – making these suitable for suppressing your airplane cabin noise, city traffic or a loud work office. They also come equipped with proprietary 40mm large-aperture drivers which provide an extended frequency range, with a deep, clean bass response (frequency response of up to 20 Hz). The around-ear fit pair also comes with a 90 degree swiveling feature and ‘Protein ear pads’ that deliver some great comfort and extra durability. The Cowin’s On-Board mic pulse remote can be used to take calls, controlling volume, or switching up the music playlist – also making these one of the best headphones with a mic. With up to 30-hours playtime in Bluetooth mode, this model can be easily recharged and also comes with a 3.5mm audio-cable that allows you to play music while your headphones are charging. If you are balling on a budget and want a good bang for your buck, grab the E-7 wireless headies. Now we look at another Bose product, the QuietComfort 20, which provide premium Acoustic Noise Cancelling in-ear headphones. 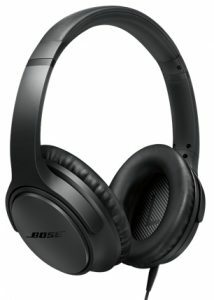 With Bose, you know you are getting a higher-priced good, but you also know that it is made with their top-of-the-line technology and trademarked-components – which is why these are one of best headphones with a microphone. The QuietComfort 20’s let you enjoy sound everywhere you go, and at your own discretion. You can turn on (or off) the Noise Cancelling feature to reduce the surrounding environment and focus on your tunes. You can also activate Aware mode, with a click of a button, to hear what’s happening around you if you are in an area you may not know – making these suitable for you avid walkers and joggers. 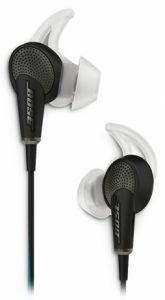 This model of Bose also features proprietary StayHear eartips which offer a custom, secure fit. 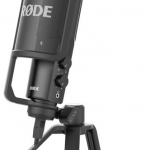 The inline microphone and 4-button remote allows you control the volume and music plus access to voice-recognition apps, like Google Search or Siri. The QC’s also come with a lithium-ion rechargeable battery that charges in just 2-hours (providing up to 16-hours of playtime per charge) and can be stored away in the carrying case when you aren’t using it – nifty right? As I said earlier, if you have deeper pockets and want a premium product, then don’t be afraid to pull the trigger on the QuietComfort 20. They were high in our best noise-cancelling earbuds guide as well as PCMag’s best earbuds post for a reason. Moving further into our best headphones with a microphone guide, we have the Sony DR-EX12IP model. These headphones feature an in-ear stereo fit, while also coming equipped with an inline mic and 3-button remote for making phone calls, taking voice notes, activating VoiceOver, controlling music playback, and adjusting volume. Powered by Sony’s technologies, this model provides quality audio sound in a lightweight and compact design that are hardly noticeable when wearing them – making these a great choice for your on-the-go lifestyles. 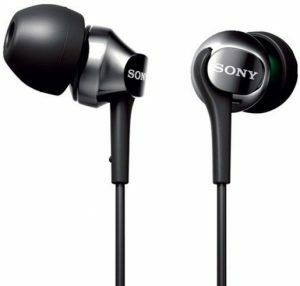 The Sony’s come with 3 sizes of soft hybrid silicone eartips facilitating a custom fit to your own ears. The 9mm dynamic drivers, with neodymium magnets, deliver clean n’ crisp audio with a wide-range of frequency response. These headphones also come with a standard 3.5mm plug that provides compatibility with all Apple devices, most MP3 players, laptops, and more. If you are a simple person (like myself), then grab this solid pair of Sony headphones. 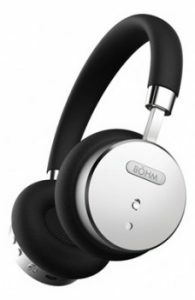 If you’re a luxurious type-of-person, then the BÖHM B-66 wireless headphones might be the best fit for you. These allow you to escape reality with your favorite music (or audiobooks), while also being featured with things like Active Noise Cancellation and an inline microphone & remote – making these one of the strongest choices for best pair of headphones with a mic. The powerful bass of these headphones is backed by two high-end drivers (measured in at Ø40mm) which crank out sounds up to an impressive frequency range of 20 Hz – 20 kHz. Remember when I said luxurious? – The lightweight aluminum housing features a Zinc alloy-metal detail with beautiful protein-leathered ear cups. The housing of the headphones also includes volume control, multi-function buttons, a USB charging port, a standard 3.5mm input, Active Noise Cancellation, and a noise cancelling indicator. The BÖHM’s have a play time of up to 16-hours, coming with a rechargeable extended battery that takes about 3-hours to charge. The makeup of these headphones scream luxury that’s hardly ever found in headphones – at any price point. Don’t miss out on a pair of these if you want to travel in style. 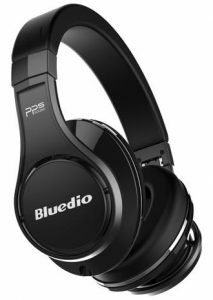 Here we have another over-ear, wireless pair of headphones, the Bluedio U (UFO) PPS 8, which have a patented high-end design that is available in the middle price-point of this guide. This pair is engineered with a Bluedio-exclusive 8 driver-design, which allows every frequency (5Hz – 25000Hz) to be accurately touched for a full-range experience. The UFO’s sound design make it feel as if you are in a virtual 360° surround sound from the built-in 3D DSP Processor – making these great for your home theater. Bluedio’s UFO are crafted with Top Al-Ti Alloy Aviation Material (also known as some aircraft metals) which features high-strength performance that does not compromise the lightweight design – allowing these to be durable and drop resistant. They come equipped with a rechargeable lithium-ion battery that provides playtime of up to 25 hours per charge, which recharges in just 3 hours. However, do not fret if they run out of battery because they also come with a wire to enjoy your music or movies while your battery is charging. This model’s microphone also comes with a microphone sensitivity of up to 120 dB, which is arguably the best for headphones with a mic. The soft-cushion and adaptive cups of the headphones allow for them to be worn hours at a time for long-lasting comfort. The UFO’s provide solid sound with some impressive features that can be obtained at a bargain of a price. Head-Fi’s UFO 8 user review has some more in-depth info on them. The Sennheiser HD 219 is a pair that provides solid bass with their powerful neodymium magnets, while also blocking ambient noise with their closed-ear design. The 3.5mm audio input make this model compatible with almost any portable or home audio device – so you can enjoy music on-the-go, or in your own peace at home. The Sennheiser’s also come with a single-sided cable for maximum flexibility, and they fold flat for easy portability. When it comes to fit, the individually adjustable ear cups make for a custom fit around your wars, and prevent any sound leakage. The Sennheiser HD 219’s could serve as the best model for your kids, as they are durable, have a simple design, and easy to use. 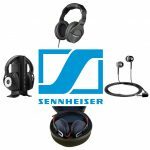 Almost to the end of our guide, we have another Sennheiser model, the HD 219 – one of the best on-ear headphones with a mic. They are also on the lower price-point of this guide, so make sure to grab a few of these for your family. Last but not least, we look at the very affordable Philips SHE3595BK/28 which have trademarked Philips technology in their design. With the integrated microphone and call button, you can enjoy hands-free technology that makes calling and receiving from your mobile device simple. The small efficient speakers and ultra-small, lightweight in-ear design provide quality sound and a secure fit for long hours of listening – making these good for your gym routine, or long studying nights. 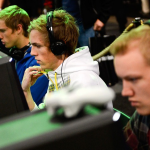 They also come equipped with 3 interchangeable ear caps (sizes small to large) for optimal fit in each ear. The Philips’ proprietary super-small speaker drivers of this model fit comfortably inside your ear, and with this fit, any outside noise is blocked out to help you focus on your jams. The 1.2mm rubberized cable relief enhances the durability of the headphones – making it ideal for outdoor use. 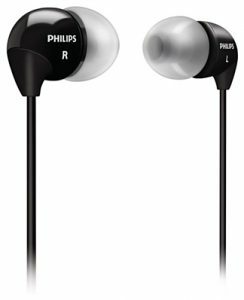 If you’re looking for some good value with your purchase, then these Philips will be one of the best headphones with a mic for you. They’re quite cheap as you can see.